Uneeda Tinyteens Doll's - The World's Best Dressed Teenage Fashion Doll. They were packaged in a locket similar to Mattel Liddle Kiddle Lockets. They are 6" tall, with rooted hair and eyelashes, posable head and arms with legs of bendable vinyl, but they do not hold a pose. Uneeda Tiny Teen dolls are marked U. D. Co. Inc. 1967 Hong Kong. 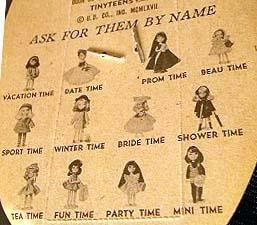 Vacation Time doll, Date Time doll, Prom Time doll, Beau Time doll. Sport Time doll, Winter Time doll, Bride Time doll, Shower Time doll. Tea Time doll, Fun Time doll, Party Time doll, Mini Time doll. Medium platinum flip rooted hair, blue painted eyes, white and red or pink polka dot and lace trimmed short night gown, doll marked U. D. Co. Inc. 1967 Hong Kong. Medium brown rooted hair with bangs, brown painted eyes, navy long sleeve shirt, navy tights, mini sleevless jumper in a purple stripe, navy plastic shoes with a white plastic TV set, doll marked U. D. Co. Inc. 1967 Hong Kong. 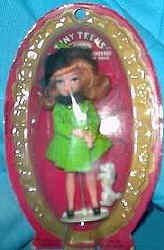 Medium red flip rooted hair, green with black trim coat, black beret hat, black plastic boots with a plastic white poodle dog, doll marked U. D. Co. Inc. 1967 Hong Kong.